Description. 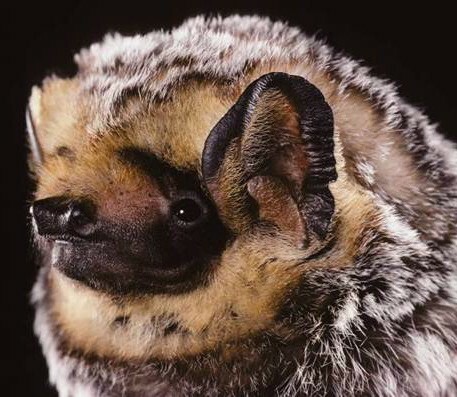 The hoary bat is the largest bat in Washington. The fur is a mixture of yellowish-brown, dark brown, and white, giving it a distinctive frosty or “hoary” appearance (Nagorsen and Brigham 1993, WBWG 2005). Individual hairs on the back have four distinct color bands, with blackish-brown at the base followed by yellowish-brown, blackish-brown, and silvery- white at the tips. Yellow or white fur occurs on the shoulders and wrists. Yellow fur also encircles the ears and is present on the throat and underside of the wing membranes. Wing membranes are blackish-brown with paler brown strips along the forearm and metacarpals. Wings are long and narrow. The upper surface of the tail membrane is densely furred. Ears are short and rounded with a dark brown or black margin, and the tragus is short and broad. The calcar has a narrow keel. Taxonomy. Three subspecies are recognized (Simmons 2005), with L. c. cinereus present in North America, including Washington. Distribution. Hoary bats have the broadest geographic distribution of any bat in the New World, including much of North America and South America, as well as Hawaii (Shump and Shump 1982a; Appendix A). This species has been documented in most of Washington’s counties (WDFW WSDM database), but is probably present in all. The sexes are relatively segregated within the species’ summer distribution, with males occurring primarily in the mountainous regions of western North America and females more numerous in eastern regions (Shump and Shump 1982a, Cryan 2003). This pattern may simply reflect that females tend to migrate farther distances than males from major wintering areas in California and Mexico. Among the few individuals captured during surveys in Washington, nearly all have thus far been males (West et al. 1984, Thomas 1988, Campbell 1993, Fleckenstein 2000, 2001a, Baker and Lacki 2004; H Ferguson, pers. comm. ; BLM, unpubl. data). Examination of bats killed at wind farms in Washington indicate that some females pass through the state during fall migration (e.g., Kronner et al. 2008). Population status. Population sizes and trends in North America are unknown (NatureServe 2009). Shump and Shump (1982a) considered this species common in the Pacific Northwest, but most survey data from Washington instead suggest that it is relatively rare at most locations except during migration, when it is more common (Johnson and Erickson 2011). Hoary bats were infrequently or rarely detected during acoustic surveys at Mt. Rainier National Park (Petterson 2001), other sites in the western Cascades (Thomas 1988, Erickson 1993), North Cascades National Park (Christophersen and Kuntz 2003), Hanford (Gitzen et al. 2002), and the Yakima Training Center (Christy et al. 1995). Capture surveys have yielded similar results in the eastern and western Cascades (West et al. 1984, Thomas 1988, Frazier 1997, Taylor 1999, Baker and Lacki 2004), the Selkirk Mountains (Campbell 1993), at Moses Coulee (Fleckenstein 2000, Rosier and Rosenberg 2006), at Badger Gulch in Klickitat County (Fleckenstein 2001a), and on the Olympic Peninsula (West et al. 2004). In contrast to these surveys, it was frequently detected at Joint Base Lewis-McChord (Falxa 2008a) and at Hanford (Lindsey et al. 2012). Because of this species’ tendency to forage above the forest canopy, capture surveys are not effective in assessing levels of abundance. Habitat. In Washington and elsewhere, hoary bats are mainly associated with a variety of forest types, but also occur in open cover types (e.g., grasslands, deserts, clearcuts, meadows), particularly when foraging and migrating (Whitaker et al. 1981a, Hart et al. 1993, Nagorsen and Brigham 1993, Johnson and Cassidy 1997, Kalcounis et al. 1999, Adams 2003). Urban areas are also used (Nuetzmann 2001; G. Falxa, pers. comm.). Late successional forests are often occupied, perhaps because the presence of larger trees provides higher quality roosting habitat (Perkins and Cross 1988, Jung et al. 1999). Jung et al. (1999) further hypothesized that hoary bats were attracted to old-growth forests with relatively open canopies because such habitat may offer improved foraging opportunities. Elevational range varies from sea level to at least 1,620 m in the Pacific Northwest (Nagorsen and Brigham 1993, Petterson 2001), but reaches 3,100 m elsewhere (Storz and Williams 1996). In California, Vaughan and Krutzsch (1954) suggested that females may be more common in lowlands and coastal valleys, and males more common in foothills and mountainous areas. Roosts and roosting behavior. Hoary bats roost alone or with dependent young primarily in the foliage of coniferous and deciduous trees at heights ranging from 3-16 m above the ground (Shump and Shump 1982a, WBWG 2005, Willis and Brigham 2005, Klug et al. 2012). Roost trees are commonly near the edges of clearings (Constantine 1966), and may or may not be taller than the adjacent canopy (Jung et al. 1999, Willis and Brigham 2005). Reproductive females appear to select locations on the south sides of tree canopies that provide protection from wind and greater sun exposure, which likely enhances warming (Willis and Brigham 2005, Klug et al. 2012). Easy flight access and concealment from predators are other desirable roost characteristics (Nagorsen and Brigham 1993, Klug et al. 2012). Rarely, roosting can occur in tree cavities, caves, buildings, and squirrel nests; beneath rock ledges and bridges; and other locations (Nagorsen and Brigham 1993, Hendricks et al. 2005, WBWG 2005). Detailed information on summer roost selection by this species appears to be lacking for the Pacific Northwest. During summer, family groups comprised of a female and her young may use the same roost for a two weeks or more (Nagorsen and Brigham 1993, Willis and Brigham 2005), or may change roosts much frequently (Veilleux et al. 2009). Adult females and their nursing young commonly enter torpor while roosting (Hickey and Fenton 1996, Koehler and Barclay 2000, Klug and Barclay 2013). Periods of multi-day torpor during pregnancy have also been observed (Willis et al. 2006b). Relatively little is known about the night and migration roosts of this species. Hibernating individuals have been found on tree trunks and in tree cavities, squirrel nests, and clumps of Spanish-moss (NatureServe 2009). Other details of hibernation are poorly known. Reproduction. Mating likely occurs in fall or early winter before, during, or after migration, with ovulation and fertilization delayed until spring (Shump and Shump 1982a, Van Zyll de Jong 1985, Cryan et al. 2012). Gestation lasts about 90 days (NatureServe 2009). Females produce one to four pups in a single litter per year, with an average litter size of two (Shump and Shump 1982a, Willis and Brigham 2005). Breeding has not been confirmed in the Pacific Northwest (Nagorsen and Brigham 1993, Johnson and Cassidy 1997, Verts and Carraway 1998), but if it occurs, births probably take place in June followed by nursing through July (Nagorsen and Brigham 1993). Females may carry their young in flight until they are 6-7 days old (Shump and Shump 1982a). Young are capable of sustained flight by one month of age, but remain dependent on the female for several additional weeks (Nagorsen and Brigham 1993, Koehler and Barclay 2000). Some or most juvenile males and females become sexually mature in their first autumn (Cryan et al. 2012). Food habits and foraging. This species is commonly considered a moth specialist (Shump and Shump 1982a), but Barclay (1985) reported it to be simply an opportunistic feeder with a preference for large prey. The only dietary data for the Pacific Northwest come from Oregon, where several studies suggest a preference for moths, with leaf hoppers, true bugs, mosquitoes, and other insects consumed in lesser amounts (Whitaker 1977, 1981a, Ober and Hayes 2008a). In other regions, hoary bats also feed on beetles, grasshoppers, dragonflies, wasps, termites, midges, and other flies (Shump and Shump 1982a, Barclay 1985, Rolseth et al. 1994, Valdez and Cryan 2009, Reimer et al. 2010). Emergence from day roosts usually occurs later in the evening after other bat species become active (Shump and Shump 1982a). Feeding lasts all night, but often peaks during the middle of the night (Shump and Shump 1982a, Barclay 1985). Hoary bats are fast straight fliers with less maneuverability than most other bats, and have low frequency echolocation calls that are adapted for long range detection of prey (Barclay 1985, 1986). Thus, foraging occurs mainly in open areas, such as above the forest canopy, over clearings and other open areas, along roads with trees, over lakes and streams, and at street lights (Whitaker et al. 1981a, Barclay 1985, Nagorsen and Brigham 1993, Hart et al. 1993, Kalcounis et al. 1999). Individuals may forage 1.6 km or more from their day roosts (NatureServe 2009). This species sometimes establishes feeding territories that are defended against other bats through chasing, vocalizing, and occasional physical contact (Barclay 1985). Reproductive females gradually increase the amount of time spent foraging until the young fledge (Barclay 1989). Seasonal movements. Hoary bats are considered migratory, but most details of migration are poorly known. California and Mexico are significant wintering areas, but some hoary bats overwinter in the eastern U.S. as well (Cryan 2003). A few winter records also exist for the northwestern U.S. and British Columbia (Cryan 2003), including two January records from Washington (a specimen from Mukilteo, Perkins et al. 1990; an acoustic record from Thurston County, G. Falxa, pers. comm.). It is unknown whether these represent unusual occurrences or if the species winters in greater numbers in the region than currently realized. Spring migration probably occurs mainly from April to June (Koehler and Barclay 2000, Cryan 2003, Valdez and Cryan 2009), with females migrating earlier than males (van Zyll de Jong 1985, Valdez and Cryan 2009). Most females that winter in California may travel east, whereas most males from there may move north to localities that include the Pacific Northwest (Cryan 2003). The earlier migration by females may reflect their longer flights to breeding season locations. Valdez and Cryan (2009) reported hoary bats traveling at low elevations along water courses during spring migration. Most fall migration probably occurs between early August and October (Dalquest 1943, Nagorsen and Brigham 1993, Koehler and Barclay 2000, Cryan 2003). Based on mortalities at wind energy farms, these dates also apply to fall migration through Washington (e.g., Kronner et al. 2008; numerous other unpublished reports). Hoary bats from the Pacific Northwest probably migrate to California or Mexico (Nagorsen and Brigham 1993, Cryan 2003). Migration routes in both seasons are poorly understood (Cryan 2003), although sizeable numbers of males and females are known to move through eastern Washington and north-central Oregon in autumn (Johnson and Erickson 2011). Hoary bats sometimes migrate in groups that can number in the hundreds (Shump and Shump 1982a, NatureServe 2009). Threats. Mortality at wind energy facilities is likely the greatest threat to the species, with large numbers killed during migration in Washington and much of North America (Arnett et al. 2008, Johnson and Erickson 2011). Logging of larger trees is another concern to this species because it eliminates or reduces roosting habitat (WBWG 2005). Widespread application of pesticides on forest lands is a potential source of mortality to roosting bats and their insect prey. In suburban settings, where jays and crows thrive in association with humans, these birds may kill some sleeping or hibernating hoary bats (WBWG 2005). Conservation measures. Pre-construction surveys of proposed wind energy facilities should be used to establish the timing and location of potential conflicts so that mitigation measures can be used to reduce mortality to this species. At existing wind farms, surveys are needed to document mortalities and measures are needed to further reduce mortalities. Evidence from Perkins and Cross (1988) and from other species of Lasiurus in eastern forests (Shump and Shump 1982b, Menzel et al. 1998, Hutchinson and Lacki 2000) suggest that retention of older forests with large trees may benefit hoary bats in the West. Documentation of the temporal and spatial distribution of this species throughout Washington, including important migratory pathways, will help inform conservation measures and the appropriate time to apply them.